At this stage it became apparent, that I wouldn't be able to add the pink heart I had planned (it was closer to magenta) and I decided on a green heart. 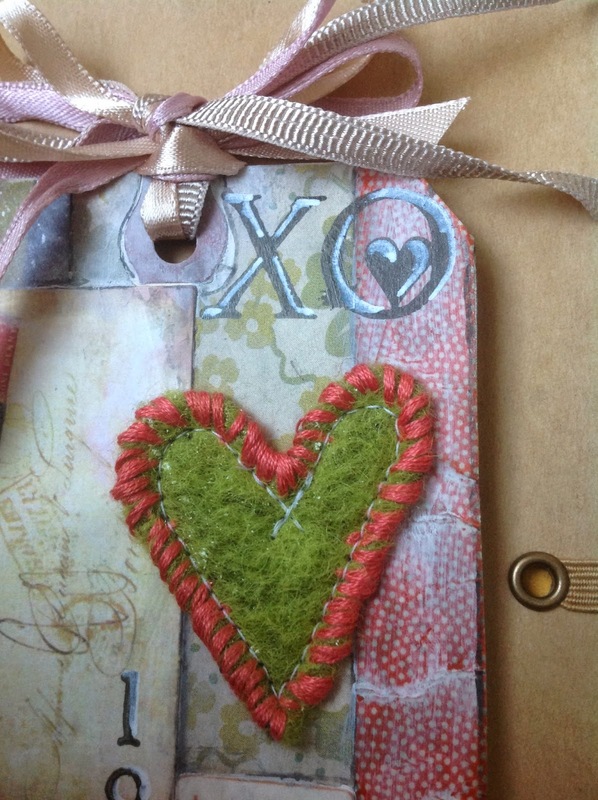 I added some orange-red washi tape to the tag and sewed around the heart with a salmon red embroidery thread. After adding the "XO" stamping and highlighting it with a Sharpie pen I started thinking I might actually grow to like this tag! l-o-v-e with peg stamps and added a heart I once made with shrink plastic. 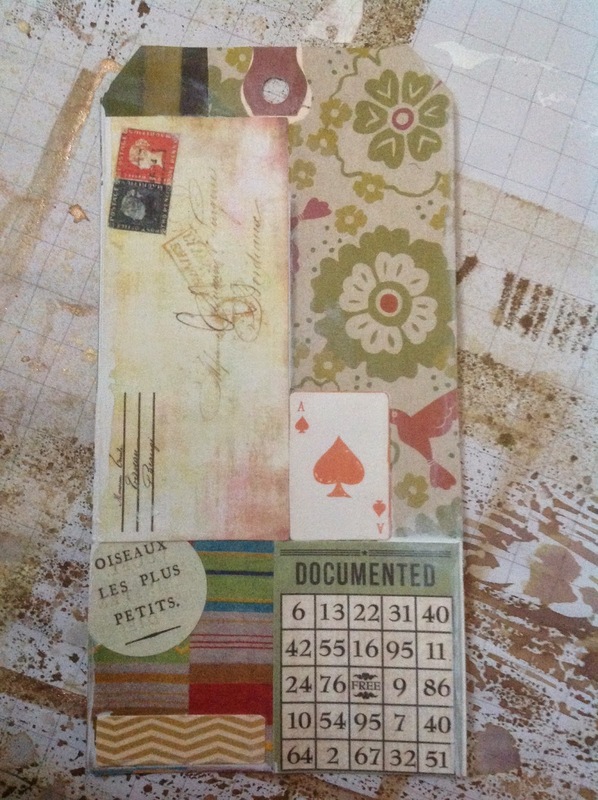 I have decided I won't buy new stuff to make these tags, but the sentiment on the word band of TimHoltz's version of this tag ("know in your heart that you are loved") is really luring me. There is space to add it on the left, if I happen to fall for it. At least I plan to make a spread in my art journal using that sentiment and adding a pocket for this tag. As with the January tag, I wanted to do the background of this one too. Actually I did it before adding any embellishments to the front, because I wanted to be able to stamp. I sprayed some Tattered Angels pink mist and white Picket fence on the back of the tag. When they were dry I dabbed some Peeled Paint Distress ink to an acrylic block, sprayed with water and wiped onto the edges of the tag. The ducks and sentiment are from Crafty Individuals. I stamped them with Versafine Smoky Grey, which turned out to be a bit too light. I added some colouring with my white Sharpie pen. When sewing stuff on the front side I tried to make sure they wouldn't spoil the images on the back. I was a fun surprise, that actually the sewing complemented the backside nicely. Your collage tag looks great!